For a trouble-free move to Redding, Meathead Movers is the company for you! Our professionally trained student-athlete movers are ready to get you into your new Redding home. Located in the Shasta Cascades, Redding is one of the largest cities in the area. 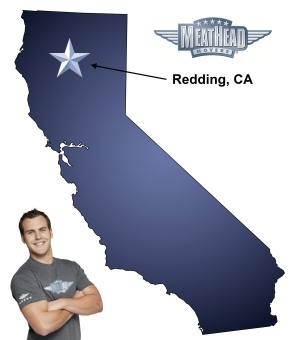 At Meathead Movers, we are proud to be the Redding movers of choice. We aim to make the experience of moving as easy and stress–free as possible. Originally inhabited by the Native American Wintu tribe, Redding was incorporated as a city in 1887. Traces of the area’s rich native past can be seen at Shasta National Park, Lassen National Park, and the Ishi Wilderness area, all located within 50 miles of downtown. Outdoors enthusiasts often use the town as a home base from which to explore the rich geography of the Cascades. Redding is also home to Turtle Bay Exposition Park, a unique complex containing a garden, museum, and rotating exhibits. The park is located on the shores of the Sacramento River. The now-famous Sundial Bridge, which straddles the Sacramento river, lies within the bounds of Turtle Bay. If you are considering a move to the area, Meathead Movers is here to help! At Meathead, we have more than 15 years of experience as the Redding movers of choice. We have the know-how and experience needed to execute your local, long-distance, or commercial move. We also provide reliable packing, storage, on-site relocations, and our distinctive moving concierge service, which connects you with local service providers. Our friendly office staff use a proprietary software program to track every phase of your move. We are confident in our ability to provide great service, so we offer a 100% satisfaction guarantee to all customers. Prepare for your move with our Princess Packers, who will ensure that all your precious possessions are carefully boxed and ready for your move. If you are planning for an upcoming long-distance move, we guarantee that the same movers will be with your possessions from the point of origin to your new home. All our movers are friendly clean-cut, drug-free student athletes, who make the most of your time by jogging when not carrying your possessions. We offer our movers incentives to take great care of your possessions and to earn great customer feedback. Moving should be an enjoyable, stress-free experience. Whether you need help packing, planning, or with storage, we are prepared to help. At Meathead, we hope we can serve as your movers of choice. Call us today for a free, no-obligation moving quote. Moving to Redding? Here are some helpful resources.